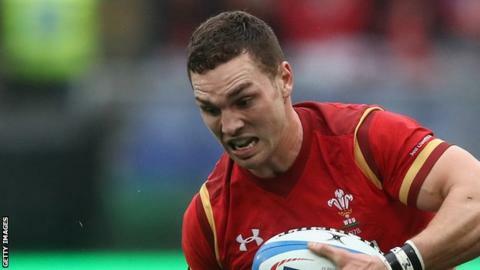 George North has trained with Wales five days before their Six Nations match with Scotland at Murrayfield. The Northampton Saints winger was a late withdrawal before the 21-16 defeat by England in Cardiff after suffering a bruised thigh against Italy. "North is looking healthy, we will be selecting from strength," said defence coach Shaun Edwards. The 24-year-old was selected for the match against England but was withdrawn an hour before kick-off. Edwards, who said there were no further injury concerns for Wales, added: "As defensive coach I'll be wanting him to concentrate on his defensive duties. But when he gets the ball he has the X factor about him as we saw in the first Test against Italy when he scored that try." The former GB rugby league international accepted interim coach Rob Howley faces a selection dilemma in the back row where Taulupe Faletau is fit again. But he claimed the choice between the Bath number eight and the trio of Ross Moriarty, Sam Warburton and Justin Tipuric who impressed against England was "a good one to have." What happened for England's winning try? Wales lost to England following a late try by Elliot Daly, with the defence caught out by a wide pass from Owen Farrell following a misdirected clearance kick by Jonathan Davies. Edwards revealed the team had not stuck to their normal strategy after claiming possession from England with less than four minutes remaining and while leading 16-14. "What happened was we broke our structure," he said. "From an unstructured turnover where our backs actually turn the ball over we're supposed to go through two rucks to get our backs back on their feet and our kick chasers. "We didn't do that. We passed it back to the kicker after one ruck which was a mistake. I don't think even Jonathan expected the ball which was probably one of the reasons the kick wasn't as accurate as it normally is. "But everyone makes mistakes. And if one of us makes a mistake we all make a mistake together so it's not a matter of us and them it's a matter of we. "Our kick chase wasn't set up because we expected another ruck after the turnover. We didn't have a kick chase in position and that was the issue."